I was on the horns of a dilemma today. My original idea, when planning the weekend, was to go from Southwold to Great Yarmouth, but, looking at the maps in more detail, that seemed too far. Lowestoft, on the other hand didn’t seem far enough. 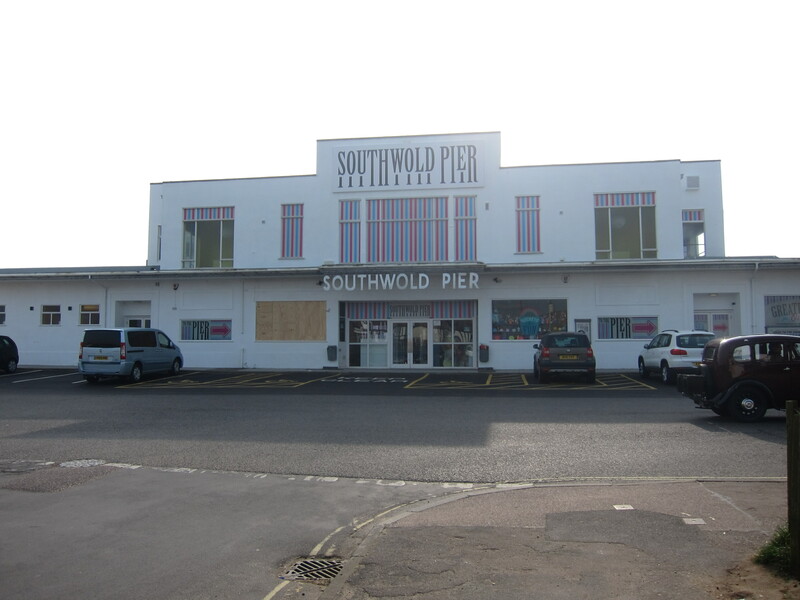 There was no logical place in between to stop between the two, so I decided on discretion- helped by the fact that there is a bus between Lowestoft and Southwold which would save me a huge taxi fare. It was the right decision as my camera ran out of space for more photos just as I walked into Lowestoft. The day started very well – I parked for free (!) near Southwold pier and walked along the front for a few hundred yards. The pier is a real Art Deco gem. The sun was shining, and the wind much less fierce than yesterday. Owing to the massive storm surge last December, much of the coast is inaccessible. I turned inland on the Suffolk Heath and Coast Path. 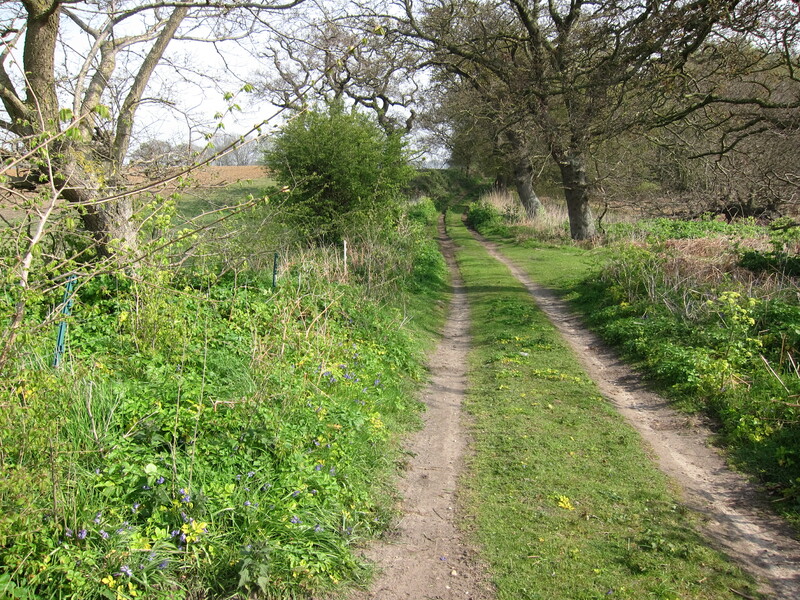 It was a delightful morning – the path was mainly along a byway, with banks of windflowers on either side – true bluebells, primroses, ragged robin and sweet woodruff. I like Suffolk, it feels more rural than Essex, and the countryside is gently rolling, rather than completely flat. 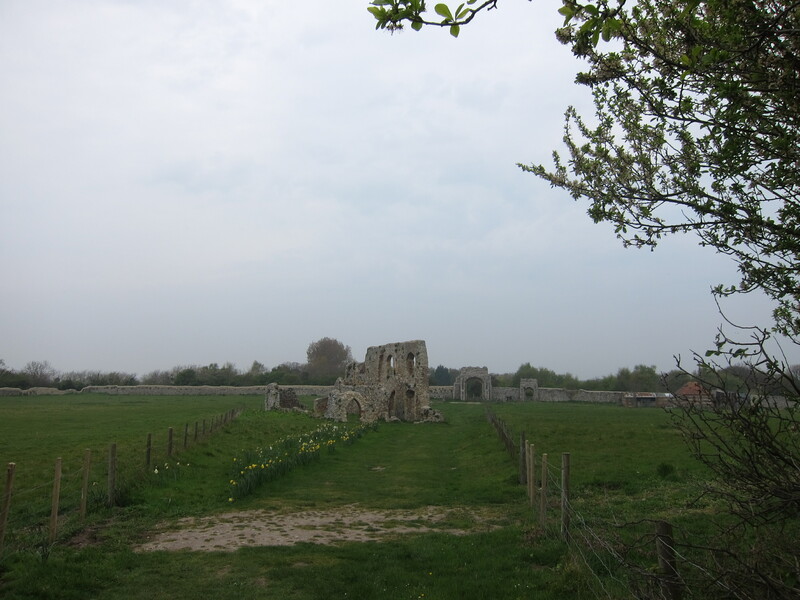 After some 5 or 6 miles inland, the path turned directly east to the coast at Kessingland. I stopped for elevenses (see review), then followed the path directly onto the beach. I was a bit apprehensive that it would be miles of shingle, but, although there were a few sand dunes to negotiate initially, it was possible to walk on firm sand. The view was different from any coast I have walked on before. A vast expanse of beach – the tide was out, a completely flat, rather than sloping foreshore, and low sandstone cliffs. Oddly, the landscape reminded me of th e high plains in South America – an impression enhanced by the presence of a lone rider, walking, then cantering along on a grey horse. The only thing to spoil the picture was the rider’s high-vis jacket – not sure the ‘ealth ‘n’ filth have got to Bolivia. I could see a marvellous kite from a good mile distance – it was a giant squid, with beautiful waving tentacles, dancing on the stiff breeze. Advancing towards Lowestoft, I had to look lively as the tide was coming in, forcing me to walk on the shingle, dodging around fishermen. These chaps have all the gear -several rods on stands, windbreaks and one even had a girlfriend, clearly bored out of her mind as she huddled on a beer cooler in layers of down -presumably she is still in the courtship stage of pretending to love his hobbies. The sun was out, and the nippy wind was not enough to put off the determined holiday-makers out with bucket and spade. Those who know me well, will be aware that children are not really my thing, but it is great to see so many of them building sand castles, digging to Australia, scooting along the prom, flying kites with dad and playing ball games. I almost smiled at them, but was returned to sanity when I passed a clutch of them at a chip shop all chanting “we want food” at the tops of their voices. I was very fortunate only to have to a few minutes for a bus, and got back to Southwold just as fat spots of rain began to fall. I did a very light weight 13 miles, but they were all enjoyable. I think I have seen more varied scenery today, than any other day. The distance was modest compared with yesterday, but that has taken me through pretty villages, past bleak nuclear power station, over heath, woodland, farmland, a ruined friary and marsh. I began around 9.15 in Aldeburgh, interestingly spelt Aldbro on the milestone in the high street (London 94, Wickham market 12). I took lots of pictures of the high street, and particularly the Moot Hall, built in 16th century for the Town Hall, and still used for that purpose today. Since it was only 9.30 on Easter Day with a biting cold wind, I had the place pretty much to myself except for the fresh fish stalls and the super-keen runners. The beach is flat and shingly, but fortunately the land side has enough build-up of soil and grass to make it walkable. It is not exciting scenery so I made fast time to Thorpeness, where I stopped for coffee and a Hot Cross bun in a cafe overlooking the village pond. Most of the other patrons were Londoners and I heard a good deal about “my mother’s friend’s art gallery in Fulham” and “the affordable art fair in Battersea”, now becoming “unaffordable”. This was interspersed with “Olivia, don’t do that” and “Sebastian is doing so well with his violin.” I don’t think my muddy boots, rumpled hair and generally wind-swept look were quite what they were used to and I felt no compulsion to hang around. 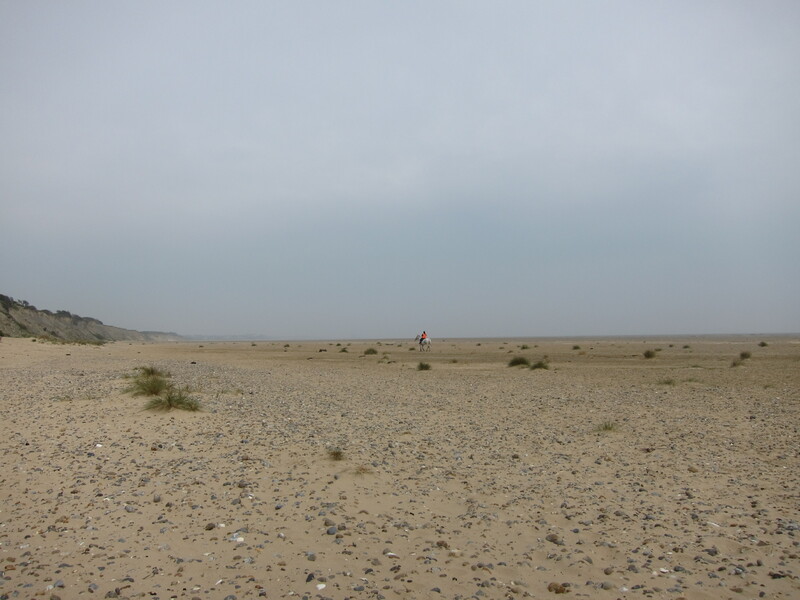 Leaving Thorpeness, there is no defined path along the beach, and I could not face more shingle, so I followed the Suffolk Coast and Heath path inland for a bit, along an old byway over heathland, covered in gorse. This took me into the largest pig farm I have ever seen. Hundreds of sides of bacon on the hoof, each with its own little Nissan hut shelter. Being spring, there was plenty of energetic courting going on. Eventually, the path turned back towards the shore, and after passing through some light woodland on the cliff top, below an old hall, it dropped down to a very bleak grassy, sandy stretch running in front of huge Sizewell Power station. It looked quite as sinister as Bradwell, back in Essex, with a massive dark grey concrete monolith in the middle, flanked by slightly less sinister buildings with windows, and a futuristic geodesic hemisphere. The surrounding land is, strangely, a haven for wildlife, and the next eight miles were over sites of special scientific interest and nature reserves. I can’t say I saw anything more exotic than seagulls and a few magpies today. The path climbs away from the sea up towards Dunwich, famous for its cliff fall. First, the route goes over a vast heath with all sorts of heather and gorse, with twisting sandy paths cross-crossing it (part of the Sandilands Way). It then goes through light woodland and into what is left of the village, past the ruins of a Franciscan friary, founded by Richard Fitzjohn and his wife Alice, in the early thirteenth century, then moved inland to its current site in 1289 by the burgesses of Dunwich but is only yards from the cliff edge now. It was dissolved in 1538. 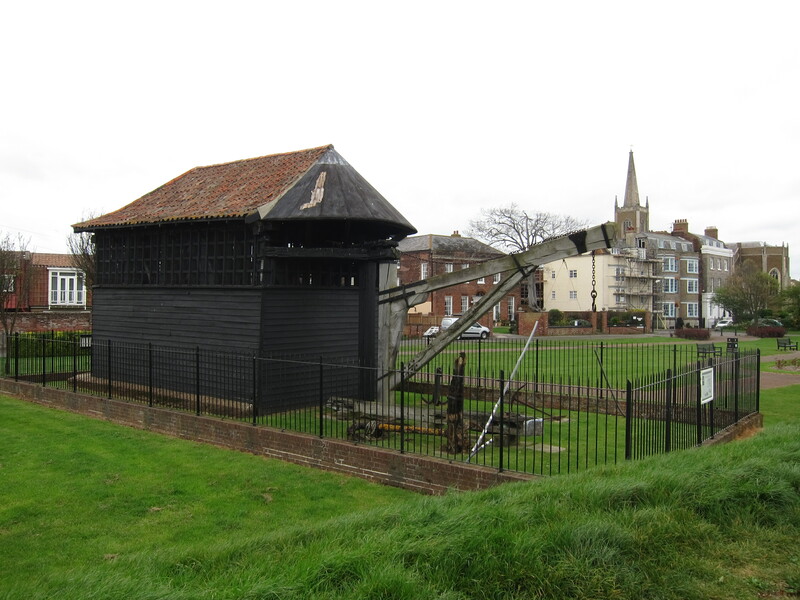 On the north side, one can opt for the inland path or crunch over the shingle into Southwold – I went for inland. The town was heaving. I stopped for a quick drink, then got a taxi back to Aldeburgh driven by a fairly elderly Greek chap, who has lived in Lowestoft for a m ere three and a half years, but it hasn’t taken long for him to become a stereotypical taxi driver with tales of scroungers and benefit cheats….. I had dinner back in Aldeburgh (see review) and am now cosy in my B&B. Distance was 15.5 miles at an average of just under 2.6 miles per hour. What a great, but exhausting day, in a new county. Suffolk. Trevor (may the gods of walking smile upon him) made the day very much better than I could have planned. To begin, he offered to pick me up in Aldeburgh and drop me back at Felixstowe, leaving at 7.45 from Aldeburgh, which saved me a long trip and a considerable amount of money at the end of the day. He also arranged the last, marvellous crossing of the Alde in a little tender owned by his friend, Alistair, without which I would have had to make a long cross country detour. Tempted by the thought of multiple river crossings (and the promise of a bacon butty in Felixstowe, Chris was persuaded to join me again, despite having finished his duty of keeping me under surveillance in Essex when we reached East Mersea yesterday. So, an early departure from Colchester, creeping out so as not to wake Rita, brought us to Aldeburgh just before 8am. We reached Felixstowe just before 9, and set out more or less from the point where the foot ferry from Harwich arrives. The ginormous cranes I mentioned in the Harwich walk looked even more impressive close to, and, in fact, remained visible for the most part of the day. The morning was bright, although we could see thick black clouds out to sea. The wind however was roaring in from the North East and howled all day, resulting in burnt faces and achey ears. We stopped on the sea front for the promised bacon butty. It proved to be authentic seaside fare – white bread and marg (ugh), but good crispy bacon and excellent coffee. 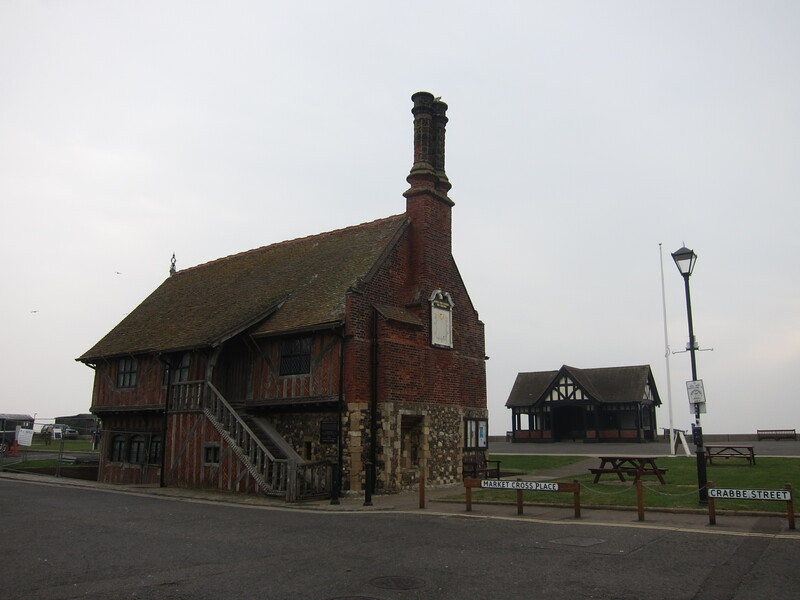 Felixstowe sea front is an interesting mix of kiss-me-quick shacks and sheds, curvaceous 1930s architecture, and at the northern end, some Victorian splendour. We set off at a cracking pace, as with well over 20 miles to do and a tide to catch, we couldn’t hang about. 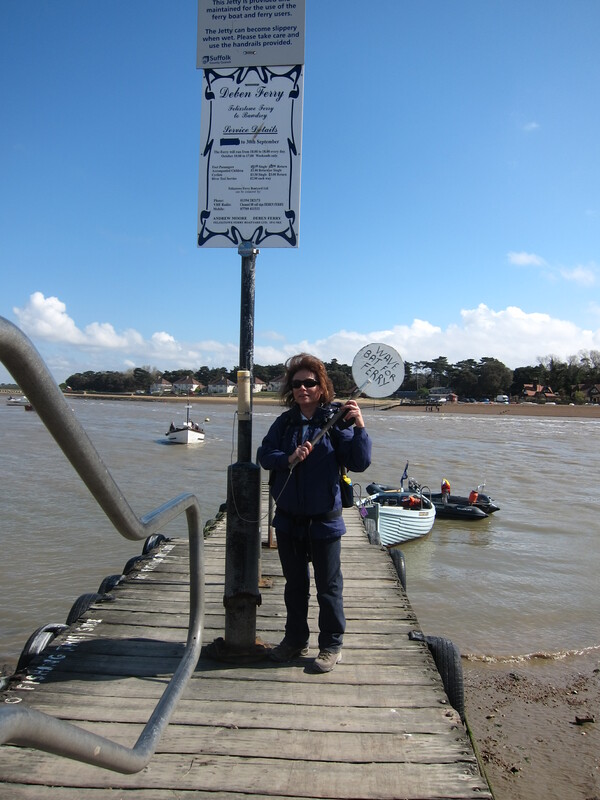 The first excitement was the ferry across the river Deben. The river is some quarter mile across, and a ferry service runs in summer. As we walked inland, with the river to our left we speculated on which of the many craft could be the ferry. We followed the instructions at the tiny jetty to wave the ping-pong bat attached to a rope to call it in. Helpfully, a little boat with sign saying “ferry” in black hand-writing on white board was attached to the little cabin. The ferryman was unimpressed by our banter, but pulled himself together enough to wish us a good trip. We crossed the choppy waters in a few minutes, and rang Trevor who was to meet us on the coast just east of Alderton. 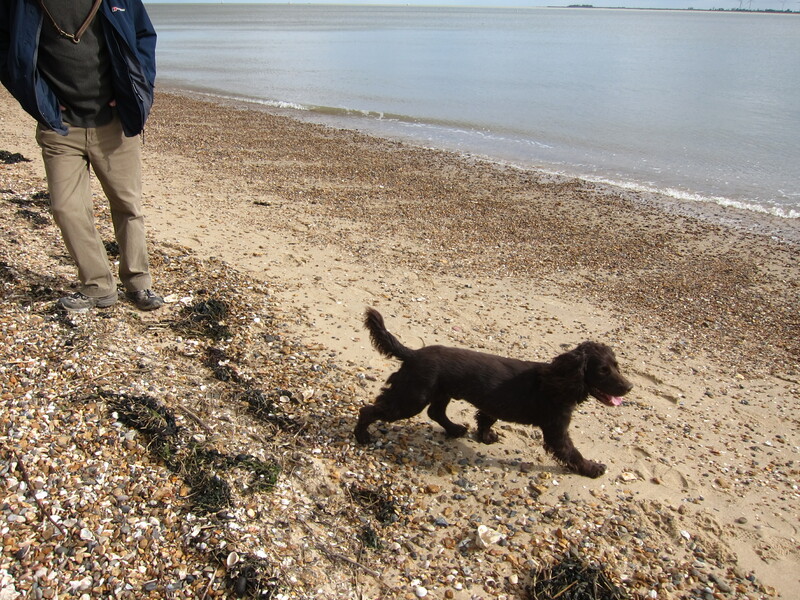 The walk round Bawdsey point was tough going. The path is on shingle which is very hard to walk on, the sky was lowering and the tide was coming in briskly. A number of signs saying beach impassable at high tide gave subliminal messages to go as fast as possible, which on shingle is much like running on the spot with weights attached to your thighs. We came to a narrow set of stairs up to the cliff top so decided to go up. The cliff top was covered with undergrowth, in particular Alexanders some 4 foot high. 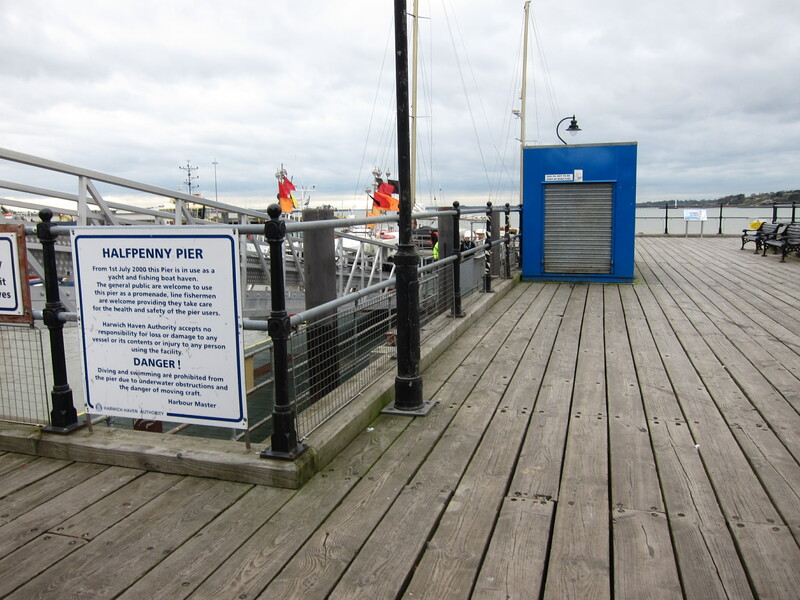 The whole of the inland side was fenced with a high mesh and stern MoD signs. The cliff top had eroded in parts, so some of the narrow bits were a bit unpleasant for someone who is not comfortable with heights. Still better than the shingle, though. Far out at sea, we could see container ships, some so large we couldn’t believe they were ships and wondered if they could be gas platforms, but no, just ships. We met Trevor on the sea wall just east of Alderton. 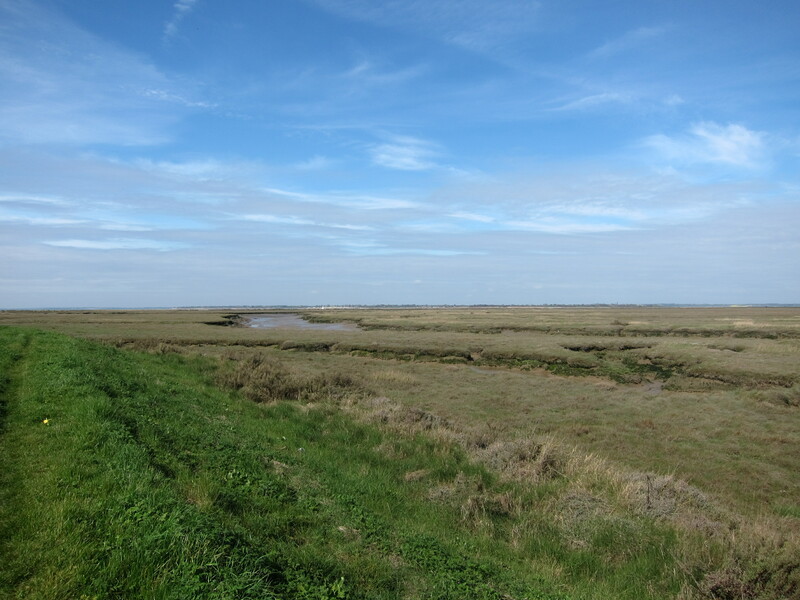 The sea wall is not dissimilar from that which I have been following in Essex, but the countryside seems completely different – a much broader view all round, and the marshes are more like reed islands with much less mud. An interesting feature along the stretch of coast is the prevalence of defensive military structures. Martello towers line the coast at half mile intervals, apparently there are 103 between Seaford (where I was last 6th April) and Aldeburgh, so I suppose I must have seen them all. There were pill boxes everywhere and mysterious other lumps of concrete. After a further five or so miles, we met Sally, Stephen, Sarah and young Benjamin at the delightful Butley ferry. Run by volunteers it takes walkers across the river to Orford, saving a long trip inland. Overhead were egrets and even a couple of marsh harriers. The ferry was a rowing boat with no outboard, and our ferry man did a sterling job, taking us all over in one go. Sally crossed with us and a couple of miles through fields brought us to the chocolate box town of Orford, heaving with visitors. We stopped for excellent cake at the Riverside tea room (crunchy lemon for me – desperate for sugar by now as I had forgotten to bring my chocolate) and sticky date for Trevor and Chris. Sarah, Stephen and Benjamin then walked along with us, well, Benjamin rode in his father’s backpack, for another 4 miles along the sea wall. 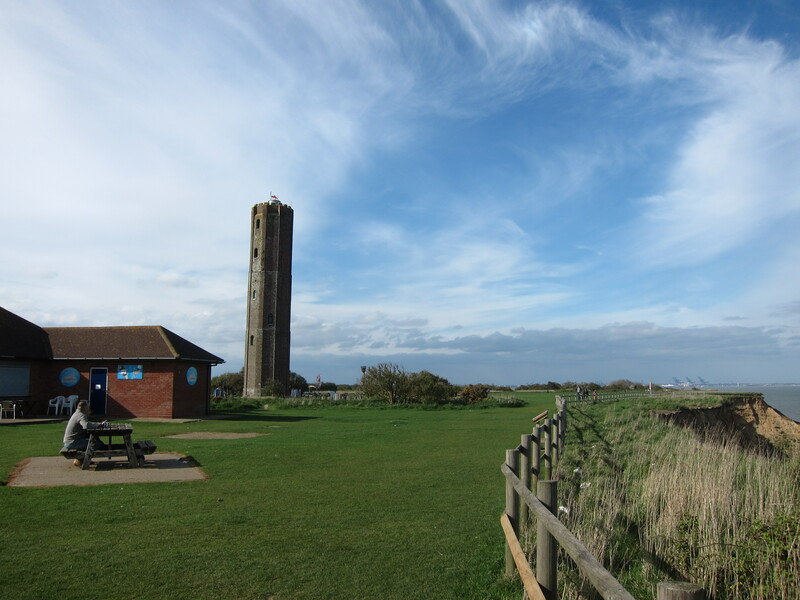 The wind was still frightful but the sky was blue and the views across to Orford Ness were lovely. Eventually, just opposite the Aldeburgh yacht club, where the Alde turns inland, Trevor’s colleague met us in his little tender and ferried us across. I was extremely grateful as 21.5 miles had taken it out of me. We were delighted to be reunited with Rita, whom we had missed at Orford, owing to the vagaries of phone signals. 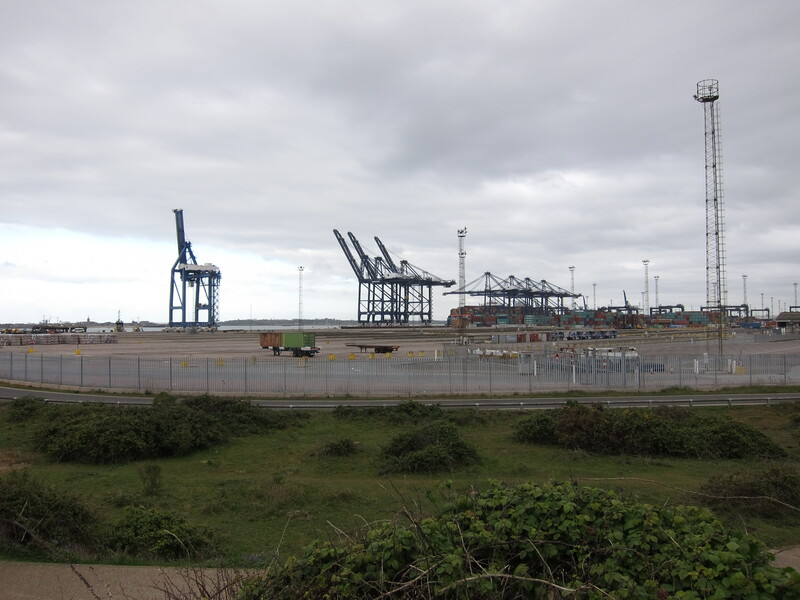 I can confirm that my pedometer is nearly spot on – I measured it between two marker posts in Felixstowe, and am under- recording by a mere 1%, which I will adjust from now on. I am sitting comfortably up in bed in Rita and Chris’ delightful spare room, after a day which hasn’t been remarkable for scenery, but has been very social. I left home ridiculously early to pick up Chris in Colchester. He and I then returned to Salcott where we finished back in March. 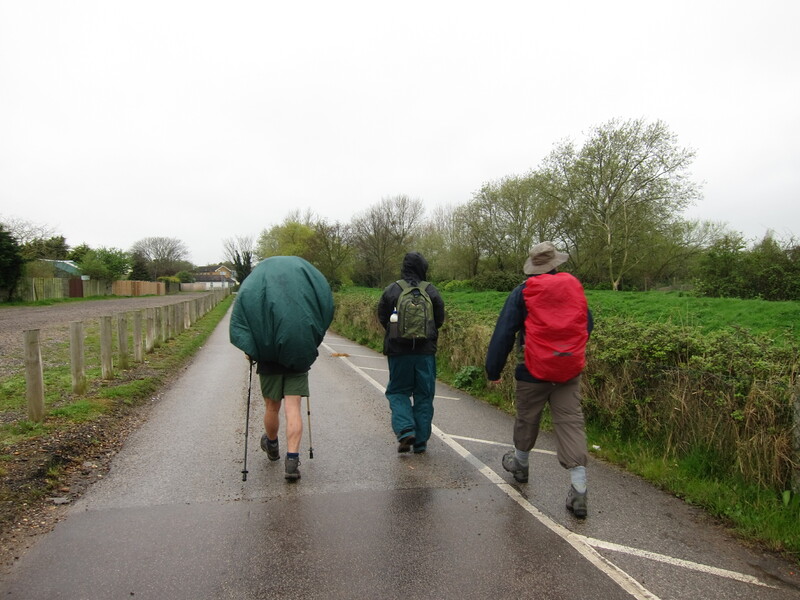 After a very short walk across a field, we walked for nearly five miles along the B1025 towards Peldon to take the only road onto Mersea Island, across the Strood. It was not very pleasant, as there was a huge volume of traffic – I have no idea where everyone can have been going, but there were something like 40 cars passing every five minutes: no pavement, so we s pent a good deal of time leaping onto hedges. Spring has arrived earlier in east Essex than in Herts – the lilacs are in full bloom and the bluebells richly carpeting the roadside verges. We stopped for a swift coffee at the Peldon rose pub – road walking is fast and we were ahead of time. Eventually, we crossed the bridge (which is impassable at high tide and walked along the north coast of the island towards West Mersea. Along the shore we could see hundreds, if not thousands of dead crabs, caught up in the reeds and seaweed – presumably carried up by a surging wave. Mersea Island is a community all to itself, the islanders are proud of their traditional fishing, and tales of smuggling abound, particularly the famous (in Mersea, at any event) tale of Mehalah which was written by Sabine Baring-Gould, the author of “Onward Christian Soldiers” and some 1200 plus other works. Apparently, the tale is not for the faint-hearted! 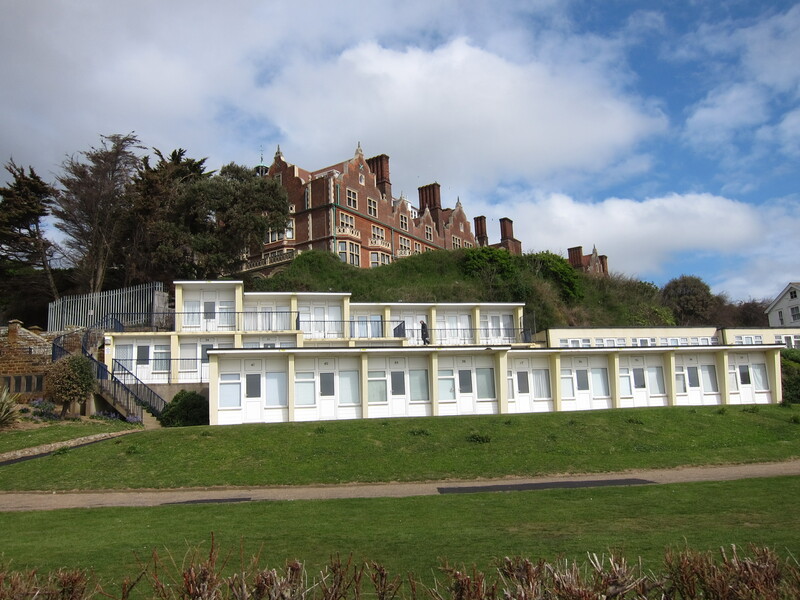 http://www.allthingsransome.net/literary/meh_top.htm It is also the setting for the 1930’s detective writer, Margery Allingham’s, first work. We were planning to meet Rita and two other friends in Mersea and go to the famous Company Shed, a no-nonsense eatery where enormous amounts of fresh fish are served, and you bring your own wine and bread. We got there just before 12 but couldn’t get a table till nearly three, so we canned that plan and ate elsewhere. Rita, Julia and Martin had walked around the north side of the island to join us, accompanied by the delightful Harvey, a gorgeous liver cocker spaniel, who leapt and frolicked with boundless energy. After lunch Chris, Martin, Harvey and I walked along the south side of the island. 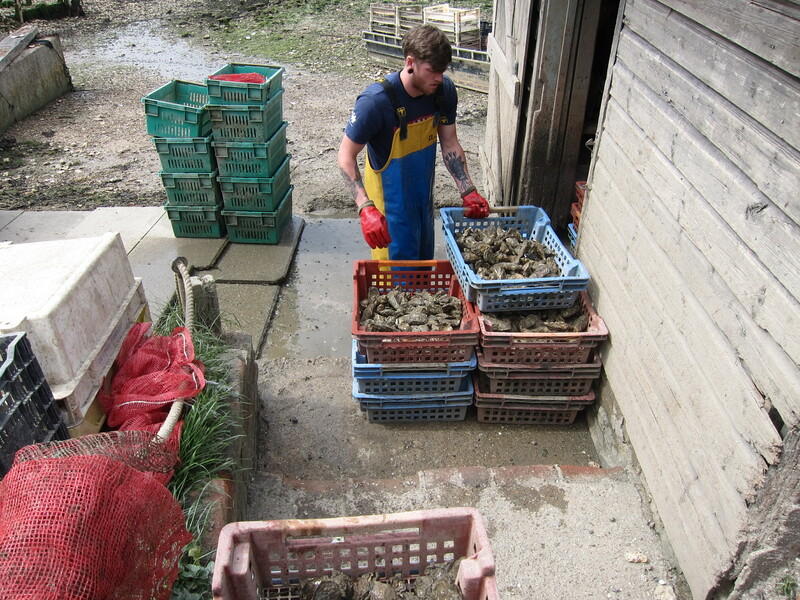 It is unremarkable, to say the least, the most interesting thing is seeing all of the fresh fish being sold, and the oysters being scrubbed. 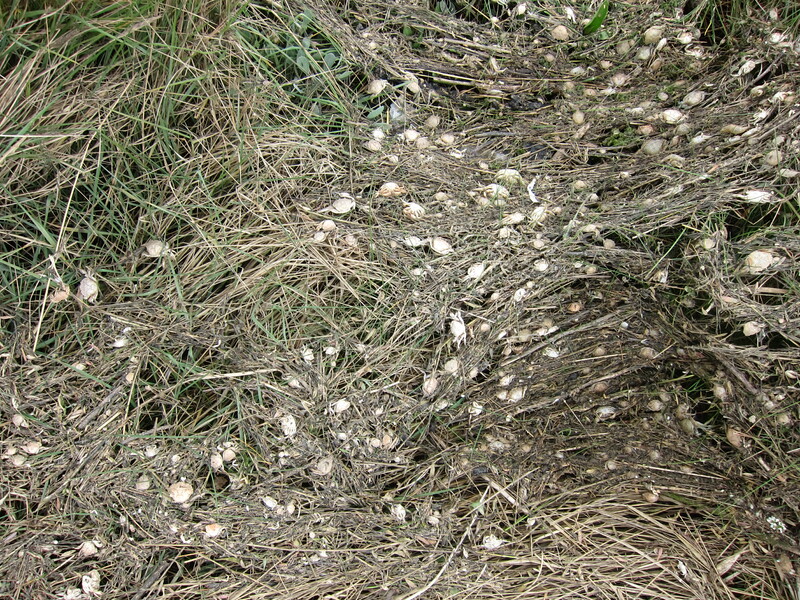 The beach, along which we walked for several miles, was littered with oyster shells. Chris picked up a few live ones, but decided to throw them back in, as the idea of eating them after a a few hours of being carried around was unappealing. We ploughed our way to Eat Mersea point from which I could see Point Clear, my previous set-off point. The weather was fine, but the wind was bitterly cold. To combat its power, I put on my exceptionally becoming snood to keep my ears warm and attracted glances of what I believed to be admiring attention, although there were other interpretations! A straightforward 13.5 miles, with some hard going on the road and beach walking. Today was a bit different from yesterday, in that there was more estuary walking again, followed by a walk through the docks at Harwich. I also had company – Tom, Chris and Chris’ friend Alan. Alan is a veteran walker – he has crossed Scotland coast to coast twenty-five (yes, that is twenty-five, not a mis-print) times for charity. He was keen to get a bit of practice in for his next Scottish trip in late May, so was walking with a very large, full rucksack. Tom & Chris picked me up from Squeaky-clean pub, which sadly had only provided the first “B” in the “B&B” combination. I had managed to find a sandwich in a con venience store, but was feeling somewhat disappointed that no bacon and eggs had materialised. We drove back to Walton-on-the-Naze to meet Alan. As I was gasping for a cuppa before setting out, we stopped at the local Hell’s Angel café for a brew to put hairs on my chest. Walking through the town, it began to rain, so there was a good deal of waterproof firkling before we could really get into our stride. Naturally, the rain then stopped. Alan’s preparations were a revelation – he had a huge thermos flask of coffee made from Bailey’s Irish Cream – it kept the coffee hot, and put a spring in all our steps! The path runs inland around the marshes for about 8 or 9 miles. There was the usual bird life to be seen – black-headed gulls, ducks of various sorts and oyster catchers. In the distance we could see the tower at Walton. Because of the presence of a factory which seems to produce explosives or something equally hush-hush, walkers are directed inland. But that was fine, as, in due course, we came to a pub at Little Oakley where we partook of fine roast beef sandwiches – almost made up for a limited breakfast. We then picked up the Essex Way, which led back to the coast and walked along the prom into Harwich. As we walked we could see the enormous cranes at Folkestone and watched a huge Maersk container ship heading out to sea. 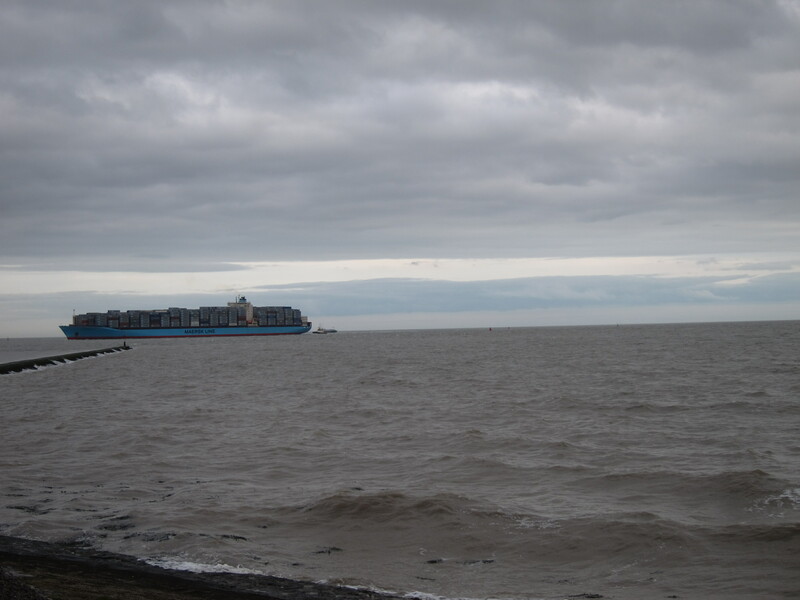 Looking at the size of it, and counting the hundreds of containers above the water line, it is almost impossible to imagine how they stay afloat – how come the containers don’t fall off in a heavy sea? I know they are tied in, of course, but it is still difficult to understand how they stay upright. Behind it was a tiny tug. We couldn’t decide whether it was actually pushing the container ship, which seemed unlikely, or if it contained the pilot, who would then be dropped off once the ship had reached the channel: maybe it was just being dragged along in the ship’s wake…..
We then walked around to the foot ferry which takes passengers across to Felixstowe before a tedious couple of miles racing down the A120 to pick up my car. The day ended with some serious debate about distance travelled – my reckoning on the map had given me a target of 17.5 miles, and my pedometer gave me 17.6 – all well and good, and consistent with other days, taking my total to 700.8 miles. Alan’s pedometer, however, maintained that we had done some 21.7 miles in total. If he is correct, then I have done another 15-20% overall. Next time I am walking in an area with mileage on the footpath signs I will check. Alan’s pedometer also shared the information that we made a total ascent of 367 feet, and reached a maximum height above sea-level of 92 feet. I am sitting in probably the cleanest pub bedroom I have ever seen! It is agonisingly clean! There is not a speck of dust or dirt anywhere in the entire establishment. The downside is that it is very close to the docks in Harwich and the clients are a little more grubby than the pub! 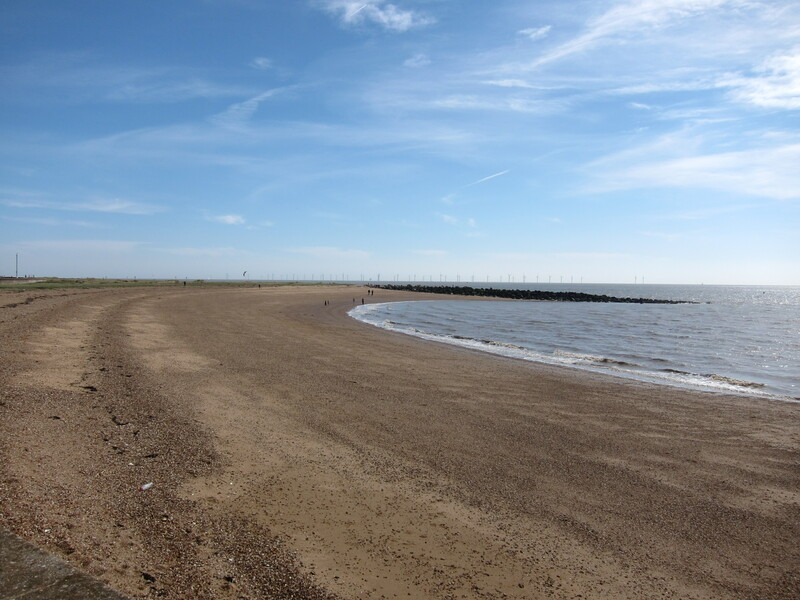 I have had a very pleasant day – not difficult, some 17.7 miles, mainly along hard surfaces (which is not so comfortable for the feet) from Point Clear near Brightlingsea to Walton-on-the-Naze. Naze apparently has the same meaning as “ness” in Dungeness or Shoeburyness. It is derived from the Saxon naess and means a promontory or headland. I hope I won’t upset the strict-minded amongst you, as I have skipped a bit from Salcott, in order to do that on Good Friday, in company with Rita and Chris who have promised an excellent lunch at The Shed in Mersea. I started at Point Clear at just after 10am, parking up near one of the vast caravan sites in the area. Ten minutes’ walk took me through the village, then I turned down a lane, through a farm and along a track, before hitting the sea wall again, just before Lee-on-Sands. I wended along that for two or three miles, accompanied by a random black Labrador, who spotted me as a likely walking companion and danced along ahead of me, until he reached the end of his territory and turned back. I then came to Jaywick. Suffice to say that I shan’t be selling up to move there any time soon, even though it does overlook the sea: although, to be fair, it is better than the Isle of Grain. 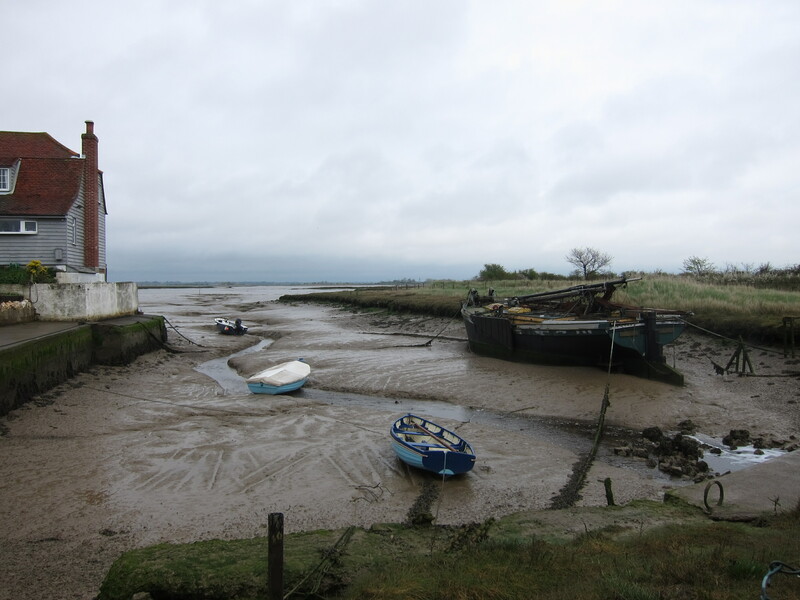 I must say, it was good to be on the actual sea shore again – I haven’t, in fact, been walking on the coast since Tom and I finished at BradwellWaterside, back in December: my most recent outings have been along the Blackwater estuary. 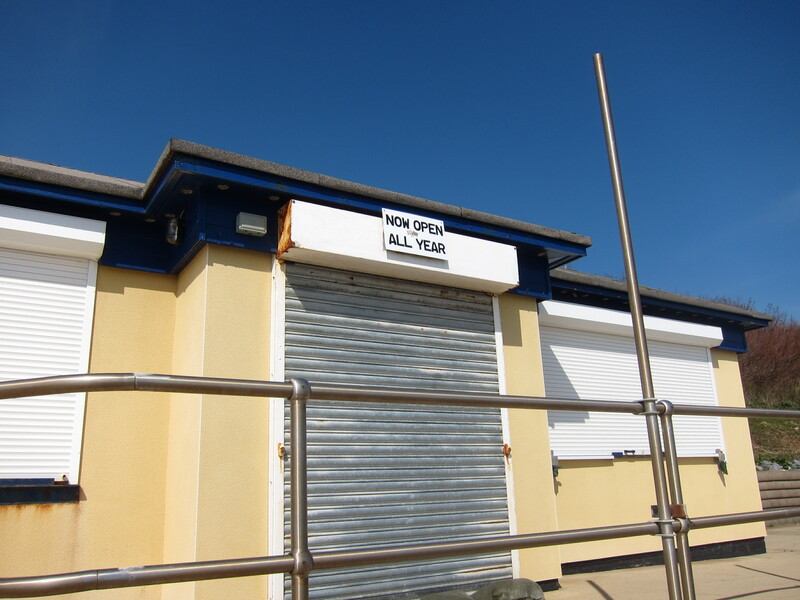 Once past Jaywick, there was some marginal improvement in the built environment through Clacton, then a further gentle increase in liveability in Frinton. The weather was exceptional – I was walking in shirt sleeves, and it must have reached 18 or 20 centigrade, despite a forecast of showers which never materialised. The coast off Frinton is dominated by a large wind farm, which I found rather mesmerising as the blades spun lazily in the moderate breeze. In due course, I arrived at Walton, where I had an excellent tea (see review), before making my way up to the Naze. 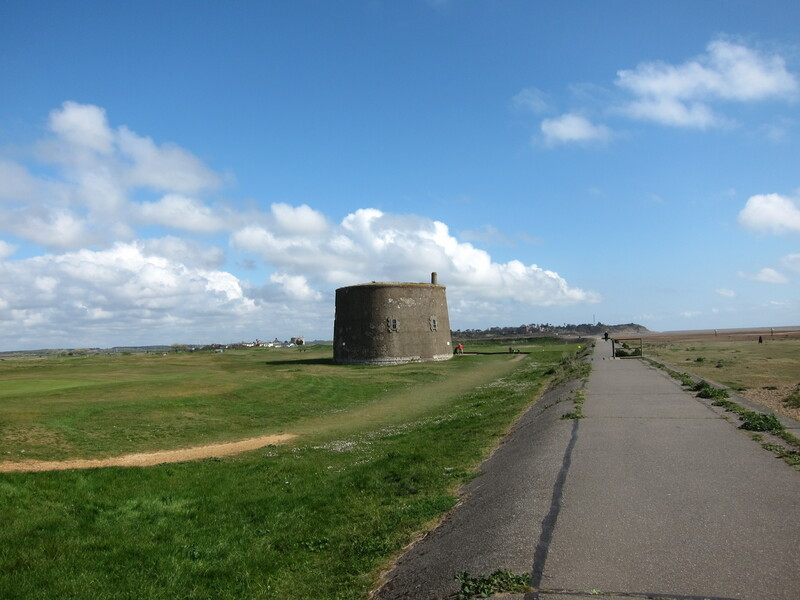 The tower originally built in the eighteenth century as a seamark is an interesting feature, as are all the WWII pill boxes. Erosion is rapidly changing the coast – the tower, originally 200 yards from the cliff edge is now only 50 yards inland as the sea creeps up some 2 yards each year. One can see some of the pill boxes have already tumbled into the ocean. My map has not kept up with the changes and I ended up walking in circles, rather than getting as close to the sea as I would have liked. I took a taxi back to the car, rather than the Sunshine Coast railway (as the route from Walton is apparently called) and drove to my B & B in Harwich.